On 30 April 1938, Preston North End defeated Huddersfield Town 1-0 in the FA Cup Final before a crowd of 93,497 at Wembley Stadium. The match is notable for being the first FA Cup final to be broadcast live on television. The first 90 minutes were scoreless, so the teams went to extra time. In the last minute of extra time, the match was still scoreless and a replay seemed inevitable when BBC commentator Thomas Woodrooffe famously said "If there's a goal scored now, I'll eat my hat." 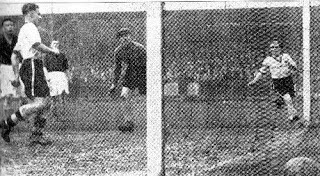 Seconds later, Preston North End were awarded a penalty, which forward George Mutch scored by bouncing it off the underside of the crossbar, giving Preston the win. Woodrooffe later kept his word, eating a hat made from cake. On 29 April 1967, Celtic defeated Aberdeen in the Scottish Cup Final, one of the five trophies claimed by the Glasgow club that season. Celtic roared through the early stages of the Cup, beating Arbroath 4-0 in the first round, then crushing Elgin City 7-0 in the second round. Queen's Park proved a more difficult opponent before succumbing 5-3, and Clyde actually held Celtic to a 0-0 draw in the semifinals, but lost 2-0 in the replay. The final was played at Hampden Park, Glasgow, before a crowd of over 126,000. Scotland was well represented, as the only non-Scottish player for either side was Aberdeen's Danish midfielder Jens Peterson. Even both managers were Scottish, with Eddie Turnbull for the Dons and Jock Stein for Celtic. 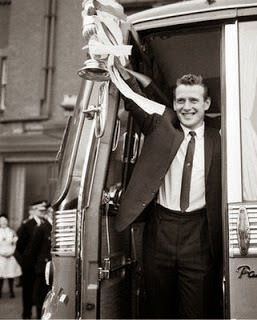 Celtic won the match 2-0, with both goals coming from forward Willie Wallace (pictured with the Scottish Cup). Celtic had already won the Glasgow Cup and the Scottish League Cup that season, and would go on to claim the league title as well. The season is best remembered, however, for their 2-1 win over Inter Milan in the European Champions Cup in Lisbon. On 28 April 1948, Evanivaldo Castro was born in Salvador de Bahia, Brazil. 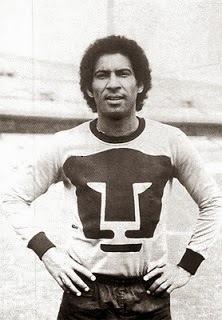 Better known as "Cabinho," he spent the majority of his career in Mexico, where he was one of the league's top goalscorers. He started his career for Brazilian club Flamengo, but played only six matches for them before moving in 1974 to Mexico's Club Universidad Nacional, better known as the UNAM Pumas. He made an immediate impact, scoring 16 goals his first season, then becoming the team's leading goalscorer for the next four seasons (though he shared that title in 1978-79 with teammate Hugo Sánchez). With Cabinho providing the attack, UNAM won their first league title in 1977. In 1979, he transferred to Atlante FC, where he continued his scoring touch, leading the team in goals in each of his first three seasons. He later played for Club León and UANL Tigres, in between returning to Brazil for a one-year stint with Paysandu. In all, he scored 312 goals in 415 matches for Mexican sides. 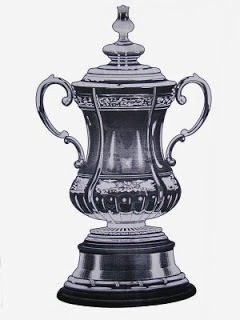 On 27 April 1901, Tottenham Hotspur defeated Sheffield United 3-1 to claim the FA Cup. 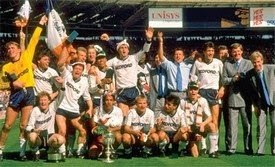 At the time, Spurs were members of the Southern League and thus were the first non-Football League side to win the FA Cup. 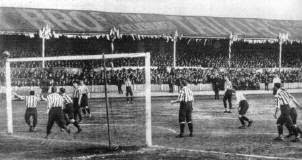 The cup final was originally played on 20 April 1901 at Crystal Palace, London, before a crowd of almost 115,000. At the end of extra time, however, Spurs and the Blades were deadlocked at 2-2, forcing a replay. The replay was held one week later, with the venue changed to Burnden Park, Bolton. The crowd was substantially smaller for the second match, with attendance barely topping 20,000. Sheffield United left winger Fred Priest gave the Blades a 1-0 lead in the 40th minute, but Spurs forward John Cameron equalized in the 52nd minute. Tottenham right winger Tom Smith then found the net in the 76th minute, putting them ahead 2-1. Finally, in the 87th minute, Spurs center forward Sandy Brown scored the final goal (pictured above) and Tottenham won 3-1. The wife of club director Morton Cadman tied colored ribbons on the FA Cup before it was presented to Spurs captain Jack Jones, starting an English tradition that endures to the present day. Labels: 1901 FA Cup Final, Alex "Sandy" Brown, Fred Priest, Jack Jones, John Cameron, Sheffield United F.C., Tom Smith, Tottenham Hotspur F.C. On 26 April 1902, English Second Division side Newton Heath F.C. changed its name. The club, nicknamed the Heathens, was founded in 1878 by workers from the Newton Heath depot of the Lancashire and Yorkshire Railway, located in the city of Manchester. 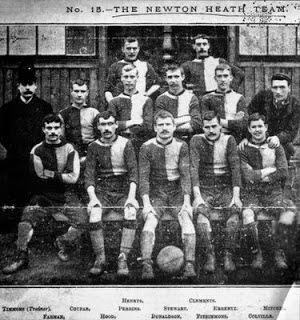 Their origins were reflected in the team's original name - Newton Heath L&YR F.C. They joined the Second Division of the Football League in 1893, dropping the "L&YR" from their name. By 1902, the Heathens were in financial trouble. Their debts - which had climbed to over £2,500 - threatened to force them into bankruptcy. The club captain, Harry Stafford, met with J.H. Davies, the managing director of the nearby Manchester Breweries. Stafford persuaded Davies to make a substantial investment, allowing the club to continue. In return, Davies became club president. The team decided to adopt a new name and colors in celebration of their new ownership and fresh start. They abandoned their gold and green shirts for red and white and, after considering such names as "Manchester Central" and "Manchester Celtic," decided to call themselves Manchester United F.C. They were promoted to the First Division soon after, in 1906, and won their first league title in 1908. Labels: Harry Stafford, J.H. Davies, Manchester United F.C., Newton Heath F.C. 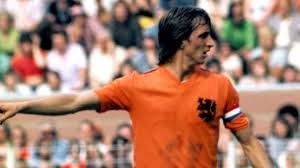 On 25 April 1947, football legend and three-time European Footballer of the Year Johan Cruyff was born in Amsterdam. A pioneer in the Dutch concept of "total football," Cruyff started his playing career at the age of 10, when he joined the Ajax youth academy. His first appearance for the first team came on 15 November 1964, when he scored the only goal for Ajax in a 3-1 loss. Within a year, he was a regular first team player, scoring 25 goals in 23 games in the 1965-66 season, as Ajax claimed the Eredivisie title. He was the league's top goalscorer the following season, with 33 goals, as Ajax again claimed the league title and also won the KNVB Cup. He stayed with Ajax until August 1973, scoring 251 goals in 319 appearances in all competitions. In the summer of 1973, Cruyff was sold to Barcelona for 6 million guilder, and immediately helped them claim the La Liga title that season - their first since 1960. He was an immediate fan favorite, and continued his prolific scoring, with 61 goals in 184 total appearances for the Catalan side. Cruyff was lured away from Barça in 1979 by the Los Angeles Aztecs, who offered him a very lucrative deal in their efforts to legitimize American football. His was named NASL Player of the Year in his one season with the Aztecs. He then played for the Washington Diplomats and Levante in Spain before returning to the Netherlands to play for Ajax and then Feyenoord. He retired from playing in 1984, but enjoyed a successful managerial career with Ajax (1986-88) and Barça (1988-96), winning multiple awards and trophies. On 24 April 1988, Luton Town F.C. staged a dramatic upset victory over heavily-favored Arsenal in the 1988 League Cup Final, claiming the club's first major trophy. Playing at Wembley Stadium before a crowd of 95,732, the Hatters shocked the defending champions by taking an early lead with a goal from forward Brian Stein in the 13th minute. In the second half, however, Arsenal rallied. Gunners striker Alan Smith brought them level in the 71st minute, then winger Martin Hayes scored three minutes later to give Arsenal a 2-1 lead. The match appeared to be a certain victory for Arsenal when, in the 85th minute, the Gunners were awarded a penalty. Luton keeper Andy Dibble saved Nigel Winterburn's spot kick, however, and the Hatters regained their early momentum. In the 82nd minute, after a faulty clearance from Arsenal defender Gus Caesar near the edge of his penalty area, Stein crossed the ball in for Luton midfielder Danny Wilson, who headed home the equalizer. With seconds left in regulation, and extra time looming, Arsenal defender and captain Tony Adams fouled Luton substitute Mark Stein. Brian Stein then scored his second goal of the match from the ensuing free kick, and Luton were League Cup champions. The trophy itself was broken during the post-match celebrations. The Hatters returned to the League Cup Final in 1989, but lost to Nottingham Forest. In 1992, they were relegated from the top flight. Luton's fortunes continued to sour, leading to subsequent relegations and administration. After spending the last five seasons out of the Football League, Luton recently earned promotion and will return for the 2014-15 season. On 23 April 1945, Bayern Munich defeated 1860 Munich 3-2 in what turned out to be the last recorded match in the Third Reich. When Hitler's National Socialist German Workers' Party came to power in 1933, the new regime quickly expanded its control into all areas of German society, including football. The Nazis appointed party member Hans von Tschammer und Osten as the country's Reichssportsführer, placing him in charge of all German sports, including the nation's football teams. As part of the new Third Reich, the football clubs were required to purge all Jews from their ranks. 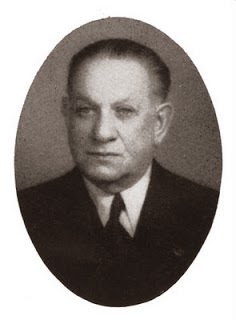 Thus, in 1933, Bayern's Jewish president, Kurt Landauer (pictured), was forced to resign. He later spent two months in a concentration camp, but escaped Germany in 1939 and fled to Switzerland. In 1940, Bayern visited Landauer in Switzerland as a show of support. He returned to Bayern in 1947. Between 1913 and 1951, he spent approximately 18 years as Bayern's president, giving him the club's longest tenure in that office. There is a street named after him in the Munich suburb of Friemann. On 2 May 1945, nine days after Bayern's victory over 1860 Munich, Germany unconditionally surrendered, officially ending the Third Reich. On 22 April 2006, legendary Newcastle United striker Alan Shearer announced his retirement from football. The Newcastle native is the all-time leader in Premier League goals with 260 (73 more than second-place Andrew Cole). Shearer joined Newcastle from Blackburn Rovers in 1996 for the then-world record transfer fee of £15 million. He proceeded to lead Newcastle to second position in the final Premier League table at the end of the 1996-97 season and to the FA Cup Finals in 1998 and 1999. 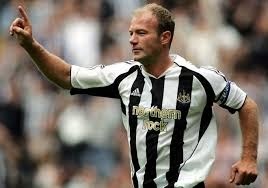 In all, Shearer made 404 appearances for the Toon, scoring a Newcastle record of 206 goals in all competitions. He scored his 206th Newcastle goal in his last competitive match, played on 17 April 2006 against Newcastle arch-rivals Sunderland. Shearer scored once in the 4-1 win, then tore the medial collateral ligament in his left knee in a collision with another player. He had previously declared his intent to retire at the end of that season, but the injury advanced his schedule, effectively ending his career with three games left. Since retirement, Shearer has enjoyed a successful career as a television pundit, making regular appearances on the BBC's Match of the Day. In April 2009, however, he returned to Newcastle as temporary manager until the end of the season, standing in for Joe Kinnear, who was in poor health. Labels: Alan Shearer, Blackburn Rovers F.C., Joe Kinnear, Newcastle United F.C. 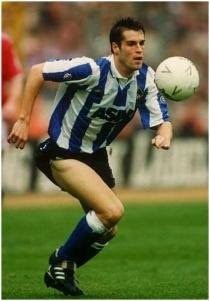 On 21 April 1991, midfielder John Harkes became the first American to play in an English cup final at Wembley Stadium. He started the match for Second Division Sheffield Wednesday against First Division Manchester United in the League Cup Final before a crowd of 77,612. The Owls beat United 1-0, with the lone goal coming from Harkes' midfield partner John Sheridan. The victory was particularly meaningful for Sheffield Wednesday manager Ron Atkinson, who had been the manager of Manchester United until 1986, when he was replaced by Alex Ferguson. Two years after his record-setting appearance, Harkes became the first American to score in a League Cup final, as the Owls lost 2-1 to Arsenal. He played in England from 1990 through the 1995-96 season, including stints at Derby County and West Ham United. In 1996, he returned to the U.S. to play for MLS side D.C. United under coach Bruce Arena, who had coached Harkes at the University of Virginia. Labels: John Harkes, John Sheridan, Manchester United F.C., Sheffield Wednesday F.C. On 20 April 2004, the English Football Association credited Marc Burrows (right) with scoring the fastest goal in football history. 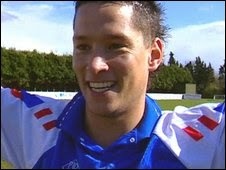 Burrows, then a forward for English non-league side Cowes Sports F.C., scored 2.5 seconds into a match on 3 April 2004 against Eastleigh F.C. Preparing for the start of the match, Burrows noticed that the Eastleigh keeper was off his line and so launched the kickoff directly toward the goal. His shot was aided by a strong wind at his back, which helped direct the ball straight into the net. Burrows was later quoted as saying "The ball just sailed over their poor keeper. I was so stunned I didn't really celebrate. I just put my hands in the air and burst out laughing." Burrows scored two other goals in the match, leading Cowes Sports to a 5-3 victory. Burrows' lightning strike beat the previous record of 2.8 seconds, made by Argentina's Ricardo Olivera in 1998. The FA waited to receive the match report from the referee before confirming the record goal. Tragically, Burrows died of cancer on 9 February 2009 at the age of 30. 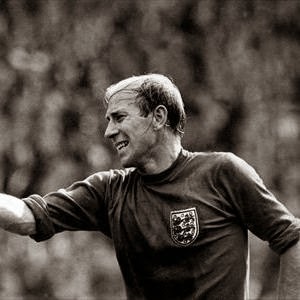 On 19 April 1958, 20-year old Manchester United striker/midfielder Bobby Charlton made his international debut for England in a British Home Championship match against Scotland at Hampden Park, Glasgow. England won 4-0, with two goals from Derek Kevan, one from Bryan Douglas, and one from Charlton - his first in an English record of 49 international goals. His last international goal came in England's 4-0 win over Colombia in a friendly played on 20 May 1970 in Bogotá. Charlton played for the English national team through the 1970 World Cup, where England was knocked out in the quarterfinals by Franz Beckenbauer's West German side. In all, he made 106 national team appearances, a record at the time, though later surpassed by Bobby Moore (108), David Beckham (109), and Peter Shilton (125), so he is now the fourth most-capped player for England. His goal-scoring record still stands, however, almost 39 years after that last goal in Colombia. On 18 April 1955, a group including Switzerland's Ernst Thommen, Italy's Ottorino Barassi, and England's Stanley Rous founded the Inter-Cities Fairs Cup, an annual football tournament for European club teams. As reflected in its name, the tournament was designed originally to promote international trade fairs, with participation limited to teams from cities participating in such fairs. The rules limited each participating city to one team each. Because the matches themselves were scheduled to coincide with the fairs, the tournament's first season ran for three years, from 1955 to 1958. That first season included teams from Barcelona, Basel, Birmingham, Cologne, Copenhagen, Frankfurt, Lausanne, Leipzig, London, Milan, Vienna, and Zagreb, with the team from Barcelona (consisting primarily of players from FC Barcelona, along with one player from RCD Espanyol) claiming the first title. In 1971, UEFA took control of the tournament and rebranded it as the UEFA Cup, with Leeds United winning the first UEFA Cup trophy. Starting in the 2009-2010 season, the tournament was rebranded again and is now called the Europa League. On 17 April 2004, D.C. United's Freddy Adu became the youngest goalscorer in MLS history before a crowd of 31,419 at New York's Giants Stadium. At 14 years, 320 days, the Ghanian-born U.S. international entered the match in the 54th minute, replacing Alecko Eskandarian. D.C. was trailing 3-1 when Adu put a six-yard shot past MetroStars goalkeeper Jonny Walker in the 75th minute. That was the last goal of the match, however, which ended 3-2 in favor of the MetroStars. Despite the loss, D.C. went on to win the MLS Cup that year, with Eskandarian claiming the honors for the league's Most Valuable Player. Adu stayed with United through the 2005-06 season, making a total of 87 appearances and scoring 11 goals. Photo copyrighted by Bill Kostroun - AP. On 16 April 1960, Rafael Benítez Maudes was born in Madrid. A midfielder, he played his youth football for Real Madrid Aficionados, the secondary reserve team for Real Madrid C.F. His senior career started in 1974, when he joined Real's primary reserve team, Real Madrid Castilla C.F. He played there from 1974 to 1981, making 247 appearances and scoring 73 goals. He subsequently played for Spanish sides A.D. Parla (1981-85; 124 appearances, 28 goals) and C.D. Linares (1985-86; 34 appearances, 17 goals) before injuries forced him to end his playing career at the age of 26. Benítez stayed in football, however, joining Real Madrid's coaching staff from 1986 to 1994, working at first with the reserve squads, then advancing to assistant manager for the first team. After the 1993-94 season, he left Real to become manager of Real Valladolid in the Primera División, but was sacked after winning only two of his first 23 matches in charge. He then moved to C.A. Osasuna in the Segunda División, but was again sacked after achieving only one win in his first nine matches. Benítez's fortunes soon turned, however, as the peripatetic coach led both C.F. Extremadura (1997-99) and C.D. Tenerife (2000-01) to promotion to the Primera División. In 2001, he moved to Valencia C.F., where he won La Liga twice (in 2002 and 2004) and the UEFA Cup (2004). 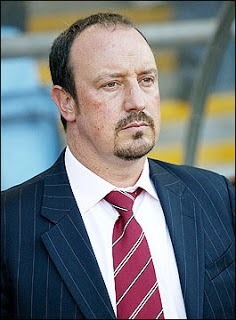 After his double-winning season in 2004, Benítez resigned from Valencia over disagreements with the sporting director and moved to Liverpool for the 2004-05 season. He led them to immediate success by winning the 2005 UEFA Champions League, followed shortly after by the FA Cup trophy in 2006. In 2010, he left Liverpool, spending time with Inter (2010) and Chelsea (2011-12) before taking charge of his current club, Napoli, in 2013. Labels: Liverpool F.C., Rafa Benítez, Real Madrid C.F., S.S.C. Napoli, Valencia C.F. 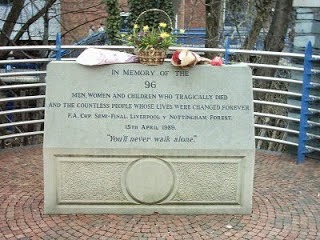 On 15 April 1989, 94 Liverpool supporters died at Hillsborough Stadium in Sheffield, England during an FA Cup semi-final match between Liverpool F.C. and Nottingham Forest F.C. Two people died later as a result of injuries sustained that day, raising the total number of fatalities to 96. A total of 766 fans were injured. The stadium - like many around the world at the time - had standing room only areas called terraces, which were sectioned off into a number of fenced pens. A number of fans showed up late to the match, having been held up by unscheduled roadworks. Large crowds formed at the entrances as the match started and the police, in order to ease the congestion and avoid injuries, opened two side gates into the central pens for the Liverpool supporters. The police failed to monitor the number of supporters in the central pens, however, so that the ensuing rush of supporters filled them far beyond capacity. The people in the front were forced up against the fencing between the terraces and the pitch, crushed by the weight of the crowd behind them. Because of an absence of stewards or police to direct the crowd, the entering supporters did not know what was happening at the front and continued to press their way in to see the match. The pressure of the crowd was so great that many of the 96 casualties died while standing up. The British government appointed Lord Justice Taylor to investigate the circumstances leading to the disaster. His conclusion, known as the Taylor Report, led to the elimination of fencing between the supporters and the pitch and the conversion of many of the larger stadiums in Britain to all-seaters. To this day, the incident at Hillsborough is the deadliest stadium-related disaster in British history. 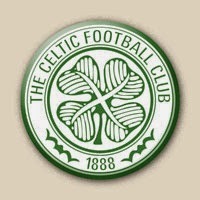 On 14 April 1917, Celtic beat Hibernian in Edinburgh by the score of 0-1. The win put a bookend on Celtic's record streak of 62 unbeaten league matches, a streak that started the previous season with a 2-0 home win over Kilmarnock on 20 November 1915. The streak was a small part of Celtic's overall dominance of the Scottish league of the period, which saw them them win four consecutive league titles from 1915-1918 under manager Willie Maley. Maley was one of the first players signed by Celtic in their inaugural season in 1888 and became their first manager in 1897. He retired in 1940, making him Celtic's longest-serving manager. In those 43 years, Maley helmed Celtic to 30 major trophies, including 16 league titles. Coincidentally, the team at the front end of Celtic's unbeaten streak - Kilmarnock - ended it on 21 April 1917, beating the Hoops in Glasgow by the score of 0-2. On 12 April 2008, Queen of the South F.C. beat Aberdeen 4-3 in the Scottish Cup to advance to their first Scottish Cup final. The club, located in Dumfries, was founded in March 1919 as the result of the merger of two area clubs - the 5th Kirkcudbrightshire Rifle Volunteers/5th Kings Own Scottish Borders Football Team and Arrol-Johnston F.C. The new club's name was taken from David Dunbar, a local poet/politician who once referred to the town of Dumfries as "the Queen of the South." Nicknamed "the Doonhamers," the club joined the Scottish Football League in 1923 as part of the Third Division. They enjoyed quick success, gaining promotion to the Second Division for the 1925-26 season, and then to the First Division for the 1933-34 season. The success was not to last, however, as 1959 saw the club relegated back to the Second Division. They returned to the top flight briefly for the 1962-63 and 1963-64 seasons, but have since moved between the second and third levels of the Scottish football pyramid. They currently play in the second tier. Although the Doonhamers lost the 2008 Scottish Cup Final to Rangers, 3-2, the final remains a high point in the club's history. Labels: Aberdeen F.C., Queen of the South F.C., Rangers F.C. On 11 April 1964, Leeds United secured their return to the First Division with a 0-3 away win over Swansea Town. Going into the match, Leeds were on top of the table and needed only a point against 18th-place Swansea to secure promotion. Striker Alan Peacock opened the scoring for the Mighty Whites in the 15th minute, then added another four minutes later. Midfielder Johnny Giles then scored the third goal in the 34th minute. Leeds' promotion to Division One was all the more remarkable, given that two years earlier, they nearly dropped down into Division Three, finishing the 1961-62 season in 19th place out of 22 Division Two teams and only three points above the relegation zone. Leeds' promotion campaign was orchestrated by manager Don Revie, who had been appointed in March of 1961. It was the first of several honors he helped secure for the club, including the Division One title in 1969 and 1974, the FA Cup in 1972, the League Cup in 1968, the Charity Shield in 1969, and the Fairs Cup in 1968 and 1971. He also led them to the finals of the European Cup Winners' Cup in 1973. On 10 April 1886, Heart of Midlothian F.C. opened its current ground, Tynecastle Stadium, with a 4-1 win in a friendly against English side Bolton Wanderers. Located on Edinburgh's Gorgie Road, the stadium has hosted a number of historic matches and undergone several renovations since that first match, including the construction of the old Main Stand by famous stadium architect Archibald Leitch. Tynecastle hosted its first international match on 26 March 1892, a British Home Championship contest between Scotland and Wales. The Scots won by the score of 6-1. Tynecastle's record attendance is 53,396, acheived for Hearts' 3rd-round Scottish Cup match against Rangers on 13 February 1932, which Hearts lost 0-1. Due to its conversion to an all-seater, however, and other renovations, Tynecastle's current capacity is 17,529. In 2004, in an effort to curb the club's rising debt, Hearts chief executive Chris Robinson announced plans to sell the stadium, claiming that it was no longer suitable. 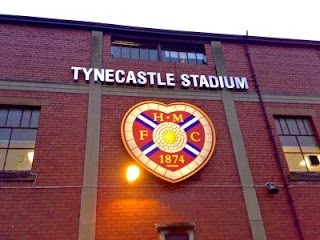 Hearts supporters strongly opposed the plan, however, and responded with the "Save Our Hearts" campaign to block the sale. The sale was canceled upon Vladimir Romanov's purchase of the club in January 2005. On 9 April 1995, 35-year old Crystal Palace supporter Paul Nixon died during an outbreak of violence before the FA Cup semi-final between Crystal Palace and Manchester United at Villa Park. According to police reports, Nixon and a group of other Crystal Palace fans were outside a pub in Walsall, eight miles from Villa Park, when they were attacked by a group of United supporters. Nixon was stabbed and hit by a brick before falling and being crushed under the wheels of a bus as he tried to escape. Nevertheless, the match was played, ending in a 2-2 draw. United won the replay four days later by the score of 2-0, with first-half goals from Gary Pallister and Steve Bruce. 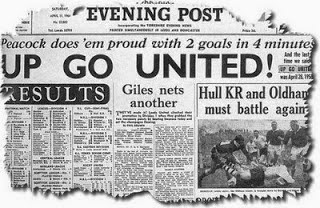 United then progressed to the final, where they lost to Everton. It was the first season since 1989 that United had failed to earn a trophy. Tensions had been high between supporters of Crystal Palace and Manchester United since January of that year, when Manchester United played away to Crystal Palace. During that match, which ended in a 1-1 draw, star United forward Eric Cantona leapt into the crowd and kicked a Palace supporter he claimed had been issuing racist taunts. Cantona was suspended for the rest of the season and fined £20,000. On 8 April 1908, Bolivian club The Strongest was founded in La Paz by Jose Leon Lopez Villamil, making it the oldest active football club in the country, as well as the only one that has played in Bolivia's top flight for over 100 years without interruption. The club's colors are yellow and black, adopted in 1908 from the colors of the Chayñita, a local bird. The Strongest have earned numerous honors, their first being the inaugural (and only) Copa Prefectural championship in 1911. That was the first football tournament played in Bolivia and was contested between amateur sides. They went on to win the first of 28 league titles in 1914. 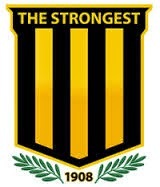 The Strongest also have the distinction of being the only Bolivian team to finish a season without conceding a goal (in 1933, though they did not win the league that year). At Bayern, Ribéry was instrumental in helping restore the club to its former glory, securing a double in 2007-08 by winning the German Cup and the league. For his role, Ribéry was named both the 2008 French Player of the Year and the 2008 German Footballer of the Year. He is currently still playing for Bayern, having won another three league titles (2010, 2013, 2014) and the Champions League (2013). On 6 April 1924, the Italian national team suffered its worst defeat to date, losing 7-1 to Hungary in Budapest. The match, a friendly, was played in preparation for the upcoming 1924 Summer Olympics in Paris (where Italy failed to earn a medal, losing 2-1 in the semifinals to silver medalist Switzerland). Italy's unlucky goalkeeper against Hungary was 22-year-old Gianpiero Combi from Juventus, making his first appearance for the Azzurri. He did not play again for the national team until almost a year later on 22 March 1925, when Italy beat France 7-0 in Turin. He was Italy's primary goalkeeper for the next ten years and helped them win the bronze medal at the 1928 Summer Olympics - Italy's first trophy - and captained them to the World Cup trophy in 1934. 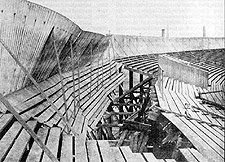 On 5 April 1902, during a match between the Scottish and English national teams at Ibrox Park in Glasgow, the West Tribune Stand collapsed, killing 25 people and injuring 547 others. Close to 80,000 people were in attendance to watch the match between Scotland and England, the first one contested between entirely professional sides. It was the final scheduled match of the 1902 British Home Championship, with the title yet to be decided. A win for either side would have delivered the championship, while Scotland could also have claimed the title with a draw. The stadium was state-of-the-art, having just been built by Rangers in 1899 for the then-substantial cost of £20,000. Early in the match, however, a portion near the top of the western terrace (pictured above) collapsed, dropping several hundred people a distance of 40 to 50 feet. The majority of the 25 fatalities were caused by impact, either from the fall or by debris from the collapsing structure. Three people reportedly died from shock trauma or heart failure. The collapse caused a panic in the crowd, forcing people onto the pitch. The game was halted for approximately 20 minutes, then resumed, with the teams playing to a 1-1 draw. After the extent of the injuries was revealed, the match was declared void. The teams held a replay on 3 May 1902 at Villa Park in Birmingham. The result was another draw, this time 2-2, giving the title to Scotland. The contractor who built the western terrace faced criminal prosecution later that year, but was acquitted of any wrongdoing in connection with the collapse. On 4 April 1991, former Tottenham star midfielder Glenn Hoddle (pictured second from the right) was appointed player-manager of Division Two side Swindon Town F.C. Prior to his term with Swindon, he had just finished a successful four-year term at AS Monaco in France playing under Arsene Wenger. (He spent a month with Chelsea in the interim, but made no senior appearances for the Blues before taking the post with the Robins). Swindon Town was Hoddle's first managerial appointment. At the time he took charge, the Robins were 17th in the Division 2 table and in danger of relegation. Hoddle kept them up, but just barely, taking only 7 points of the 24 available during the remainder of the season and finishing in 21st place, only two points above the drop zone. Under Hoddle, the Robins finished in 8th place the following season. 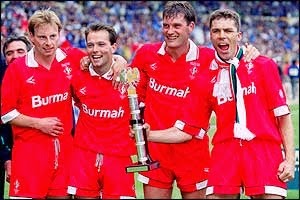 The improvement continued in the 1992-93 season, when Swindon reached the playoffs and earned promotion to England's top flight, the recently-established Premier League. Hoddle went on to manage Chelsea from 1993-96 (as player-manager from 1993-95, and solely as manager in 1996), then England from 1996-99. His tenure with English national team was controversial, despite qualifying for the 1998 World Cup, where England lost to Argentina on penalties in the second round in a match famous for David Beckham being sent off in the 47th minute. Hoddle was dimissed from the English side in 1999 after giving an interview with the Times in which he suggested that physical disabilities were the result of bad karma "from another lifetime." Hoddle returned to management with Southampton (2001-01), Tottenham Hotspur (2001-03), and Wolverhampton Wanderers (2004-06), but has since retired from management. In 2008, he established the Glenn Hoddle Academy in Jerez, Spain to aid former Premier League and Football League Championship players in their efforts to return to professional football. Labels: AS Monaco, Chelsea F.C., England, Glenn Hoddle, Southampton F.C., Swindon Town F.C., Tottenham Hotspur F.C., Wolverhampton Wanderers F.C. On 3 April 1905, Club Atletico Boca Juniors was founded in the La Boca neighborhood of Buenos Aires by five Italian immigrants - Esteban Baglietto, Juan Farenga, Teodoro Farenga, Santiago Sana, and Alfredo Scarpati. 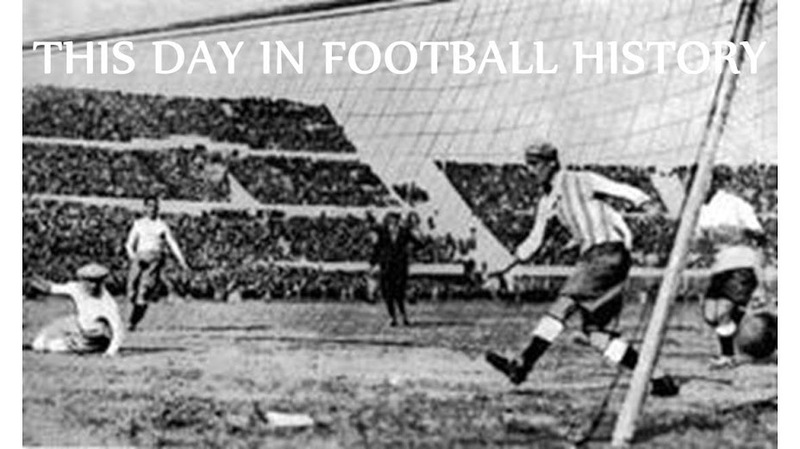 The first match was played on 21 April 1905. 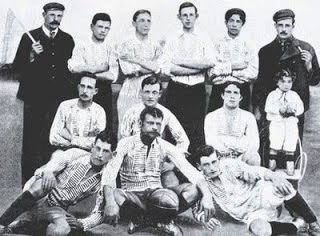 The photo above is the first-known photograph of Boca Juniors, taken in 1906. Boca Juniors play in blue and yellow, which the club reportedly patterned after the colors of the Swedish flag. Prior to that, Boca played in shirts with black and white vertical stripes, which were also used by another local club. In 1906, the two clubs played a match, with the winner keeping the stripes. Boca lost, and decided to use the colors of the first ship to sail into port at Buenos Aires, which was a Swedish freighter. Thus Boca adopted their now-famous blue and yellow kits. Boca won their first title - the Argentinian amateur championship - in 1919, starting a series of successes that now includes 32 domestic and 18 international trophies, making them one of the most decorated clubs in history. Their achievements include four Intercontinental Cup/FIFA Club World Cup titles (in 1977, 2000, 2003, and 2007). A number of international stars have played for Boca, including Juan Roman Riquelme (1995-2002 and again from 2007-present), Carlos Tevez (2001-04) and Argentine football legend Diego Maradona (1981-82, 1995-97).